You need not ask me to explain the piles of old restaurant menus and food ephemera loaded into boxes and bags in my closet, because each item is more than glad to tell its story. The 1920s candy wrapper with crumbs of ancient chocolate hiding in the creases or stained S.S. Lurline dinner card (to and from Hawaii) are straining to brag about their former flavors and who last sampled them. Vintage object are patient in the long run, but they ultimately demand total attention. When I brought that candy wrapper home from the flea, it forced me to wet my finger, press it down, and lift a very few of the tiny brown specks to my mouth. Thrilling! The ghost of chocolate past. In the same way, I was compelled to read my hundreds of menus and labels and play a version of the “catalog game,” picking one thing from each I’d most like to have. 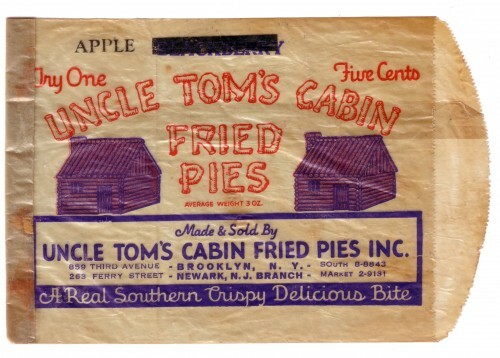 The blackberry fried pie, crossed out in the unused glassine wrapper above, is no doubt better than the apple. I’ll take it. What would I order from Hackney’s on the boardwalk in Atlantic City, the “world’s largest seafood restaurant”? A proud vacationer took this menu home on Monday, June 23, 1947, a few months before I was born — the date’s scrawled on the cover. Would it be the Lobster Thermidore with French Fries — double French on the classy Jersey shore — and biscuits , plus coffee or tea, $2.50? Don’t get too excited, Jeff, that’s the equivalent of $25.50 now. Or the Soft Shell Platter, much cheaper, but probably fresher, at $1.75. The fantasy is that everything was fresher in the past, in the world you never saw. Tastes, and pleasures, were embryonic and unsullied. Laughs were sweeter, too. Each item on every old menu is the apple before Eve. Next week, Obit Magazine will post a piece of mine called “What Dead People Ate.” (I’ll alert you.) The hook is the 40,000-strong menu collection of the New York Public Library and how the staff is crowdsourcing in order to create a menu-item database. But I’d like to share with Out There readers a menu of my own and story I didn’t include. 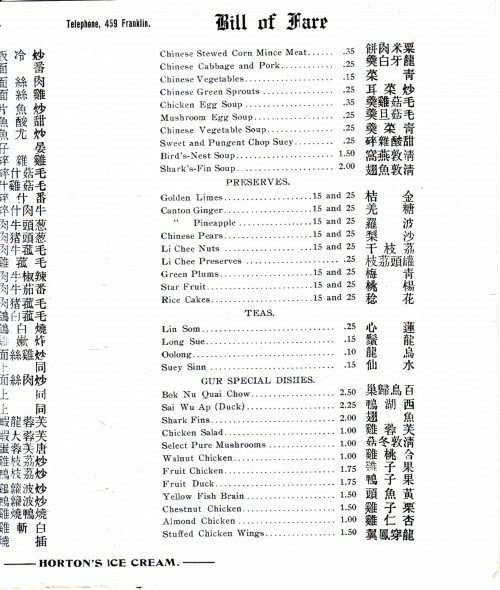 Mon Lay Won, the “Chinese Delmonico,” was a turn-of-the-last-century destination restaurant for Chinese and non-Chinese New Yorkers at 24 Pell Street. The site now holds the not-bad Vegetarian Dim Sum House. 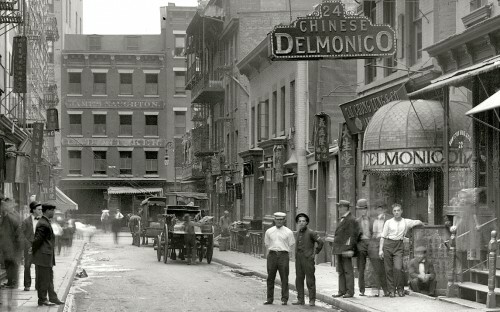 After the benefit, which raised $280 for the Kishinev Jews, Singleton threw a banquet for some prominent New Yorkers at the Chinese Delmonico Restaurant. 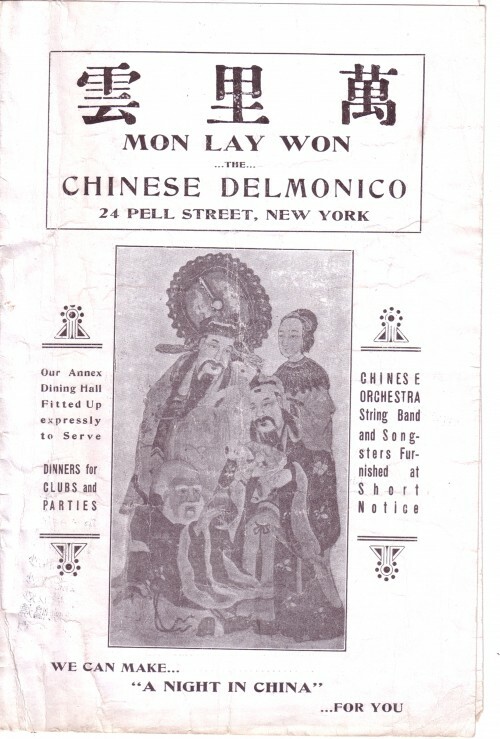 No ordinary chop suey joint, Delmonico’s–Mon Lay Won (Wan Li Yun) in Chinese–was a handsomely decorated, somewhat upscale establishment at 24 Pell Street that catered to Chinese and non-Chinese diners alike and was known throughout the city. It had Chinese-style coffered ceilings adorned with lanterns, wooden arches richly carved with dragon motifs and Chinese paintings on its walls. Round tables inlaid with mother-of-pearl decorations filled the hall, and guests sat around them on wooden stools. 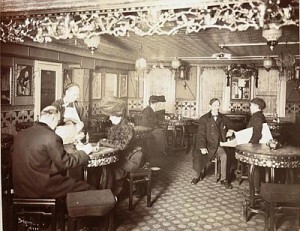 Mon Lay Won (1905). From collection of the Museum of the City of New York. Among the dinner guests that night was the famous Yiddish theatre actress Bertha Kalisch, who was appearing nearby. She and the other Jews present were apparently unfazed by the fact that Mon Lay Won, which featured pork and shrimp dishes prominently on its menu, was the antithesis of a kosher establishment. Exactly what was served that night is not recorded, but at a similar dinner Singleton had hosted there a few months before – also attended by several prominent Jews–pork and shellfish were notably absent from the table. That night, roast squab, chicken stuffed with reindeer ham, bamboo shoots and mushrooms and several varieties of fruit were served, although there was a course of shark’s fin soup. It appears that the Chinese hosts were trying, within their limited understanding of Jewish dietary laws, to make their Jewish guests as comfortable as they could, and that the Jews–at least some of whom surely were observant–were doing their best to meet the Chinese halfway. Maybe now my Mon Lay Won menu will be quiet, and I can pass over its mongrel chop sueys and choose instead the Yellow Fish Brain for $1.50, Chinese Green Sprouts for 25 cents, and Green Plum preserves for my dessert. Damn. Jeff, you’re killin’ me here. I just love reading this stuff. Thanks. How can you stuff a chicken wing? See penultimate offering (just above the Horton’s ice cream). Tobi, I’m not quite sure exactly how one stuffs a chicken wing, but I can tell you that I’ve seen stuffed chicken wings on the menus of a number of Chinese and Thai restaurants in Queens. So it can be done.